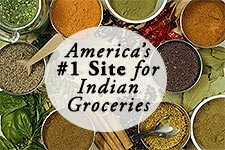 Buy Healthy, Roasted Indian Snacks Online at iShopIndian.com! 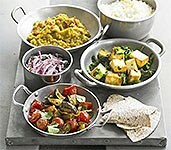 Non-Fried Indian Snacks For Healthy Munching! Traditional Indian snack mix made with roasted rice flakes, roasted lentils, raisins, almonds and spiced perfectly with sweet and spicy condiments. 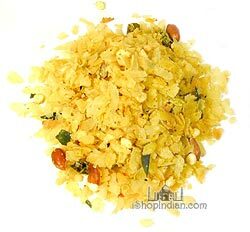 Ingredients: *flaked rice (51%), peanuts*, roasted bengal gram*, peanut oil*, cashew nuts*, raisins, almonds, sugar*, dry coconut*, curry leaves*, chilly powder*, turmeric powder*, spices and condiments*. *organic. This is roasted black chickpeas with salt, chilli powder, asafoetida and palm oil. 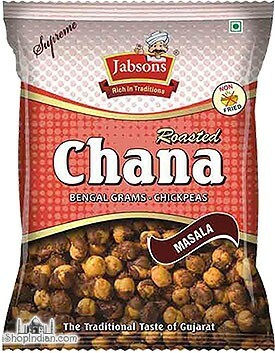 This spicy chana snack is a healthier alternative to snacking without loosing flavor and spice. 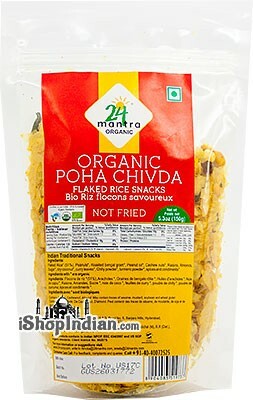 A roasted crunchy snack made with flattened rice flakes, spices, sugar, peanuts and roasted chana dal. 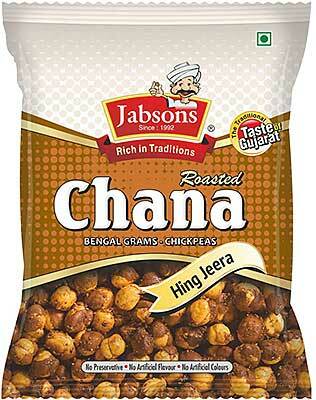 Selected Chana are Roasted Traditionally in the age-old Hand Roasting Process of Gujarat. This process gives Natural Sweetness & True Roasted Flavour to the Chana. Ingredients : Bengal Gram, Cottonseed Oil, Black Pepper 4%, Salt, Dry Mango, Cloves & Lemon. $1.69 Notification will be sent to your e-mail address every time the item price is decreased. Ingredients: Bengal Grams, Refined Cottonseed Oil, Green Chilly , Citric Acid, Asafoetida, Cummin, Maltodextrin & Salt. 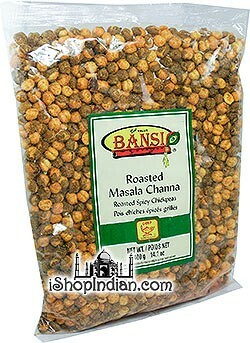 Selected Chana are Roasted Traditionally in the age-old Hand Roasting process of Gujarat. This process gives Natural Sweetness, True Roasted Flavour to the Chana. Ingredients : Bengal Gram, Cottonseed Oil, Red Chilly, Salt, Cloves & Lemon. 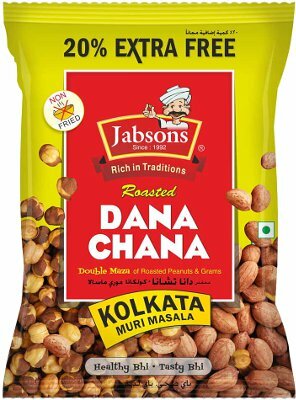 Ingredients: Roasted Peanuts 45%, Bengal Grams 45%, Refined Cottonseed Oil, Jeera (Cumin), Coriender Powder, Rock Salt, Black Pepper, Mango Powder, Chilly Powder, Citric Acid & Salt. Allergy Information: This product contains Peanuts. 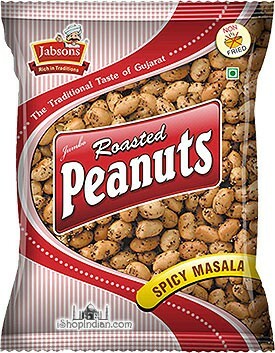 Best Quality Indian Peanuts, are Roasted in the age-old Hand Roasting process of Gujarat. This process gives Natural Sweetness, True roasted Flavour and Golden Brown Colour to the Peanuts. Ingredients: Peanuts, Refined Cottonseed Oil, Green Chilly 2%, Garlic 2%, Salt, Dry Mango, Cloves & Lemon. 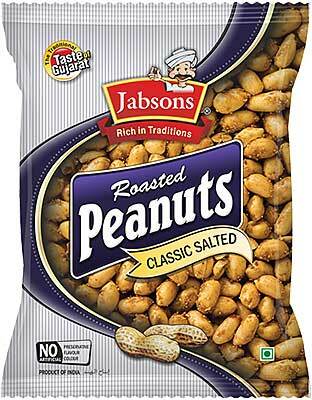 Best Quality Indian Peanuts, are Roasted in the age-old Hand Roasting process of Gujarat. This process gives the final product a natural sweetness, and the true roasted flavor and golden brown color to the peanuts. Sikandar Shing is known world-wide for its roasted and salted peanuts. For those abroad, eating these peanuts bring back memories of walking down India's busy streets and buying these peanuts from street vendors. 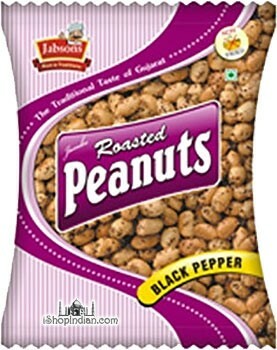 These peanuts are roasted to perfection in their outer brown skin and lightly salted. This product comes in a vacuum-sealed pouch to ensure freshness. Beware: these are highly addictive! $4.25 Notification will be sent to your e-mail address every time the item price is decreased.